I kind of feel like this is a bit self-serving as a "tribute" to Adam West...but since Light City currently occupies as much of my idle brainspace as anything else, I guess it seems appropriate to stat his Batman up here. It's even more fitting, I think, due to the fact that (obviously) I keep thinking about how a Batman-style character would fit into the Light City archetypes. Considering that he's good at...well, pretty much everything, do you focus on the martial prowess? The Bat-gadgets? The detective skills? The psychological presence? 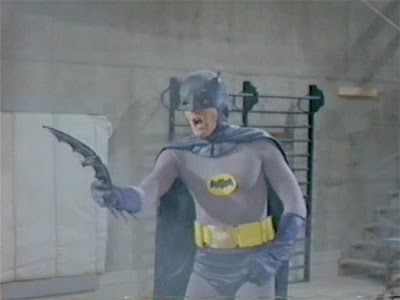 That show really demonstrated that Batman's crimefighting best often meant letting his fists do the talking, and when it wasn't his fists, he was usually improvising with his surroundings. Now, the Bat-gadgets and other Bat-goods are also clearly a trademark of the old show...but I don't think I'm doing too much of a disservice to Mr. West's Batman to make him a good old Brawler. Pow! Bam! Biff! indeed...! Image snagged from an article very much worth reading over at ComicsAlliance. 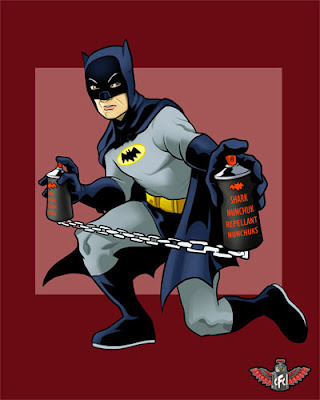 Attacks: 3x Unarmed Strikes, +8 to hit, 1d6+1 damage; Batarang, range 60 ft., +7 to hit, 1d6+1 damage; Special Improvisation 1x/day. By the artist known as CornFedCannibal. Click here for the story of this amazing image...! This is a cool tribute my friend. Even though he wasn't in the series it makes me think Ace the Bathound needs stats.